MSI have a long-standing foothold in the computer industry and are one of the go-to companies for laptops, graphics cards, motherboards and much more, but they aren’t quite as big a name in the field of peripherals, however, is that set to change with the Vigor series of keyboards? Today we’ll be taking a look at their Vigor GK70 with Cherry’s MX Red mechanical switches - it can also be purchased with Speed Silver too. The mechanical switch choice isn’t the only standout feature of the GK70, and one such element is how it integrates with other MSI products. For example, if you own an MSI graphics or motherboard you can adjust the profiles on-the-fly. There are three different modes to choose from; you can opt for the silent mode, gaming mode or OC mode, this is a highly welcomed addition for those that use MSI hardware. Other notable features include customisable RGB lighting, full N-Key rollover, a 1000Hz polling rate, a removable cable and replaceable keycaps. 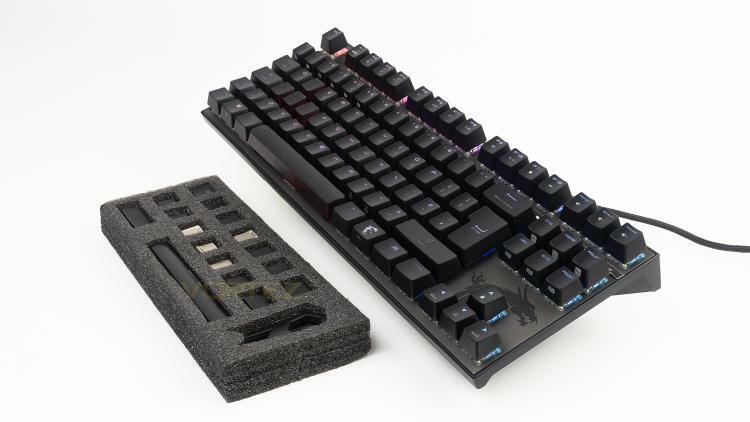 These are all features that are quite common at the GK70s £100 price point, but the replaceable keycaps are something that are not, especially how MSI has opted to approach it. Instead of just the WASD keys or in some cases the number keys, MSI has chosen to include a WASD set of Zinc Alloy tipped caps as well a set of rubber coated ones. There are a total of twelve rubber coated ones, eight are standard for WASD etc, two are for Shift and CTRL, there is also one for the space bar and the final one can replace the backspace key. As a whole, the MSI Vigor GK70 seems like a well-thought out package but does it have the chops where it really counts and does it do enough to warrant its price tag? Crafted around a strong aluminium base, the Vigor GK70 Gaming Keyboard provides gamers with a solid platform for years of intensive gaming. The long USB cable is braided and the connector is gold-plated for extraordinary durability.